Last week I trialled using the free app Up in Pieces with my Year 9 Indonesian class. Students really enjoyed the app and actually asked for more puzzles. Any app that can generate that sort of enthusiasm in a languages classroom full of 14 year old teenagers definitely needs to be considered. 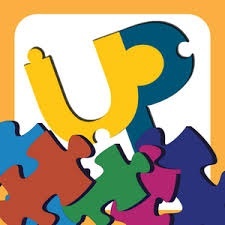 Basically, Up in Pieces turns photos into playable jigsaw puzzles. You can import any image from your Photo Library into the app. This means your puzzles could come from photos taken with the iPad camera, images saved from webpages, screenshots taken in any app, collages made with a collage app like Pic Collage, etc. Creating a puzzle is quite simple, click on the word Create and select the image you wish to use. At this point you may be required to crop a little from each side of your image, so you do need to be careful that no important parts of your puzzle will be removed. Next select the number of pieces you would like your puzzle to have, and by turning on rotate, pieces will be randomly rotated therefore making the puzzle a bit more difficult to complete. Your puzzle is then created and saved. Once saved your Up in Pieces puzzle can be shared via emailing the link. Students must have the Up in Pieces app installed in order to use the link. When you choose to share a puzzle, it is uploaded to Up in Piece’s server and is available via a hyperlink. To get the hyperlink, your options are to share it by Twitter, Facebook, or Email. As I cannot use Twitter or Facebook at my school, I chose to email the link to my students. Firstly by emailing the link to myself, and then using the bulk email function forward it to my class. I did run into difficulties as students were unable to open the link, though this could be due to permissions on my school’s network. So to make the link work I did have to manually email each student. A tedious process. Next time I might embed a QR code with the link. Though not sure this will be successful. Whilst I did have a minor technical hitch, I am planning on using this app across all year levels that I teach as my students really enjoyed using the app and it is another way that encourages students’ communication skills.